Ping.fm is a new service that allows you to update all your micro blogs at once. 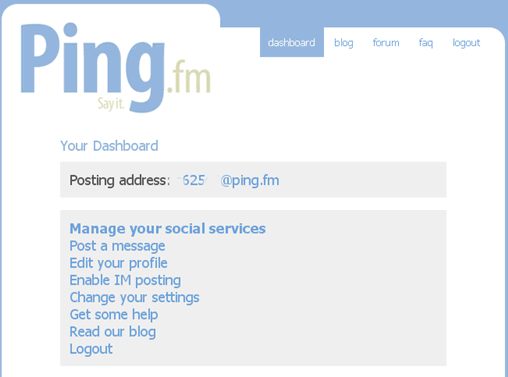 Ping.fm currently supports Twitter, Jaiku, Pownce, Facebook and Tumblr. You can post messages using Web interface, email, IM and iGoogle gadget. For posting to Facebook you need to install Facebook application first. You can also post text messages from your phone if you can send email from your phone. It is a nice service but how far it is useful for you. I am not giving up Twhirl for this, because twhirl allows me to track twitter conversations along with posting. With Ping.fm sometimes you have to wait a few minutes before your message shows up. HelloTXT is a similar service that allows you to update all micro blogs at once. Definitely looks like a smart and easy way to update the micro blogs. I am already registered and having a go at the service.